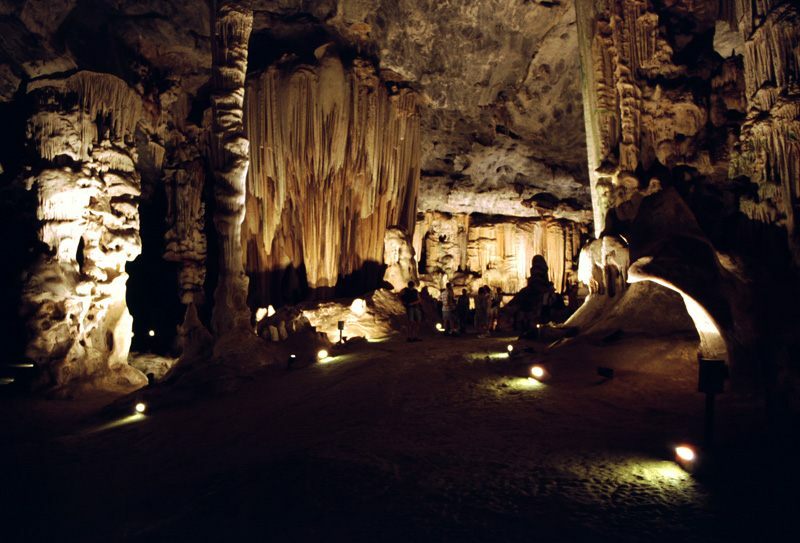 29km from Oudtshoorn, at the head of the picturesque Cango Valley, lies the spectacular underground wonder of the Klein Karoo - The Cango Caves. The Cango Caves is one of the worlds great natural wonders, sculptured by nature through the millenia. 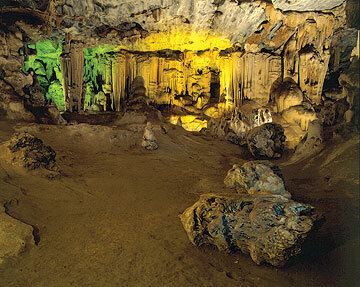 The Cango Caves lie in the Swartberg Mountain Range in a limestone belt measuring 1,5km in width and almost 16km in length. The limestone layer was formed by the deposit of 'oolites' which are loosely-bound calcium carbonate crystals. Due to the age of the limestone (750 million years) no fossils have been found. This part of the continent was once below the ocean. As the continent rose and upliftment occurred, the Little Karoo finally found itself above the water level. The caves only started to form some 20 million years ago, when the water level dropped to such an extent that the ground water could start to seep into the limestone. As the water seeped into the ground it absorbed carbon dioxide from the decaying plant and animal matter in the soil and this made it fairly acidic. As it seeped into the limestone, cavities were created that filled with water. Rivers also formed on the surface and cut deeply enough into the limestone to allow them to reach the level of the water pockets. This caused the water to flow out about 4 million years ago. The cave was then, for the first time, exposed to air and the speleothems or cave formations could begin forming. 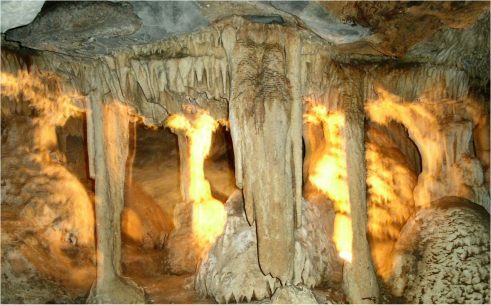 The Caves are a series of dripstone caverns that open into vast halls of towering stalagmite formations with names like ‘the bridal couple’, ‘glass flower fantasy’, ‘weird cango candle’ and ‘the hanging shawl’. Not all of the caves are open to the public - there is more than one section to the caves that took millions of years to form one of the world’s great natural wonders - but the main sections are available for amazing exploratory subterranean walks that include fumbling around on all fours in an effort to see all that is viewable. For thousands of years, the caves were unknown, except to animals. However, about 10 000 years ago, the Khoisan used the entrance area of the cave as shelter. They never wandered deeper into the cave though due to their superstitious nature. The entrance area to the Caves was originally rich in bushman paintings though with time these have been damaged. The San left this area and their cave approximately 500 years ago. 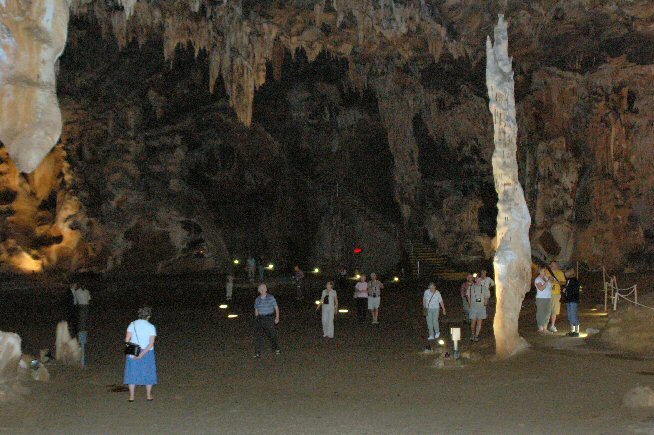 It was not until 1780 that the Cango Caves were again discovered. A herder, Klaas Windvogel, in search of lost cattle stumbled upon the cave entrance. He left the cave to get help from a Mr. Barend Oppel who was a teacher to a Mr. Jacobus van Zyl's children. On the 11th July 1780, Mr. van Zyl, Mr. Oppel and Mr. Windvogel entered the cave and lowered Mr. van Zyl down a precipice into the cave. The first chamber, now appropriately named Van Zyl's Hall, was estimated by Mr. van Zyl to be 5 miles long, 3 miles wide and 1 mile high. He was, however, exploring the cave with nothing more than a candle and his calculations were thus very inaccurate. Slowly, over the years, more and more chambers and tunnels were discovered and in 1891 the first tour was conducted through the Cango Caves. It was only between 1972 and 1975 that Cango 2, 3, 4 and 5 were discovered. The present tourist route extends for 1,2km into the cave, with a further 4,1km being kept closed to the public for conservation reasons. The Caves are open to the public every day of the year except on Christmas Day. 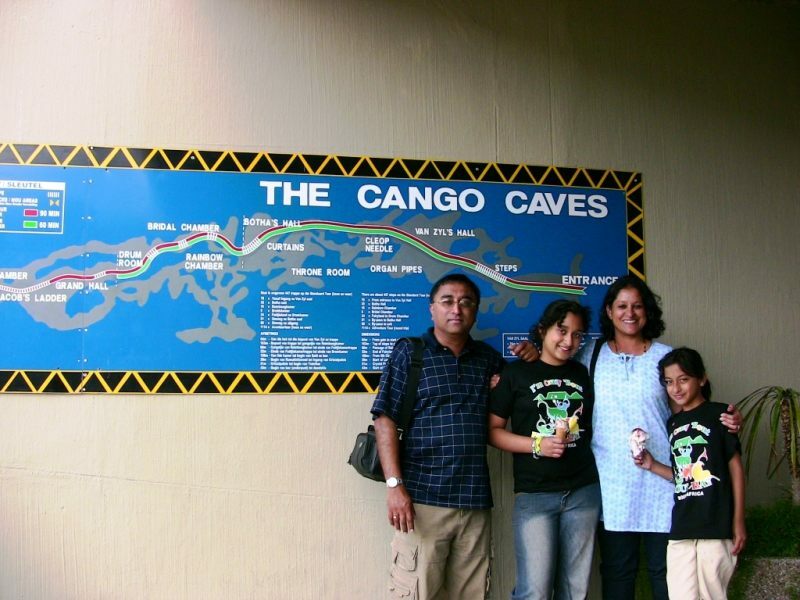 The Cango Caves are open 364 days of the year, closed only on Christmas Day (25 December). Standard tours (60 minutes) are available from 09h00 to 16h00 (tours depart on the hour). Adventure tours (90 minutes) are available from 09h30 to 15h30 (tours depart on the half hour). Standard tours cost R85 per adult and R50 per child (duration: 60 min). Adventure tours cost R105 per adult and R65 per child (duration: 90 min). Prices are subject to change. Please confirm when booking. All tours are offered in English but an Afrikaans, German, French or other language guide may be available (please check availability when booking if you have a preference).